These maps explore the American Community Survey 5-year data (Table S1810) on disability estimates by county. For hearing difficulty the ACS asks if a respondent is deaf or has serious difficulty hearing. If they answer “yes” they are classified as having a hearing difficulty. This data is for all ages. Click on the image to view a full size, shareable version of the map. This map of the United States shows rates of hearing difficulty by county. Rates are broken down into four categories ranging from 0.0 to 8.2%. Rates of hearing difficulty appear to be higher (2.1 to 8.2%) in southern Nevada, parts of New Mexico and southern Colorado, Appalachia and parts of the south (Arkansas, Mississippi, and Alabama), and northern Michigan. Rates seem to be lower (0.0 to 1.3%) across Alaska, the Great Lakes, most of Wyoming, and parts of the Rocky Mountains and Utah. To browse or download the data used to make this map, use our Disability Data Lookup Tool. Map produced January 2019 based on 2013-2017 American Community Survey data. 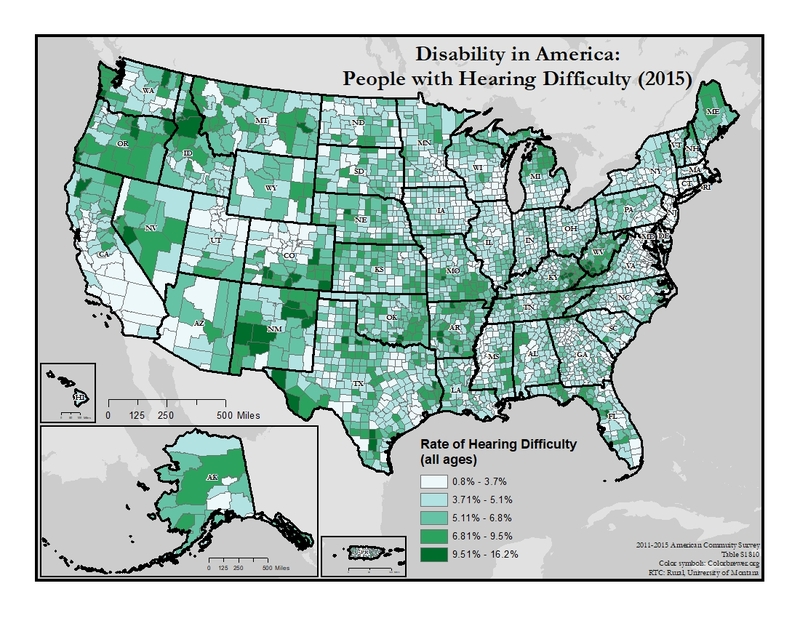 Map of people reporting hearing difficulty in the United States. Click on the image to view a full size, shareable version of the map. 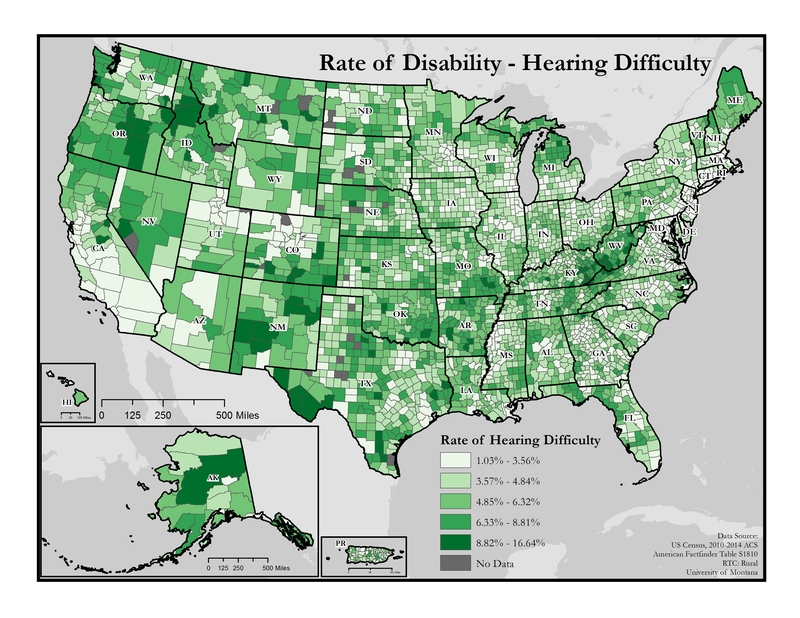 This map of the United States shows rates of hearing difficulty by county. Rates are broken down into five categories ranging from 0.8% to 16.2%. 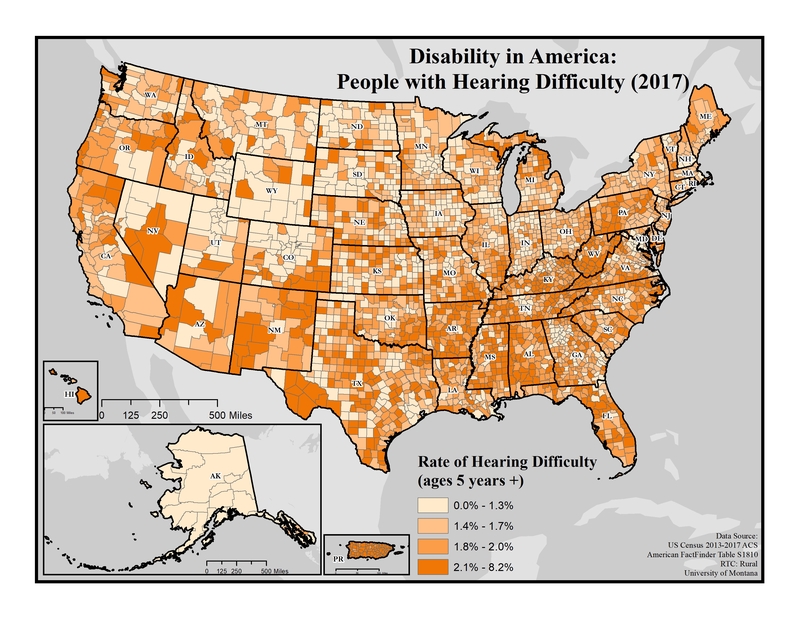 Rates of hearing difficulty appear to be higher (6.81-16.2%) in Oregon, southern Nevada, parts of New Mexico and southern Colorado, the Kentucky-West Virginia border, central Alaska, northern Maine, northern Michigan, and northern Idaho. Rates seem to be lower (0.8-6.8%) in southern California, the Great Lakes, the Atlantic Coast, and fairly variable across the rest of America. To browse or download the data this map was created with, use our Disability Counts Data Finder tool. Map produced July 2017 based on 2011-2015 American Community Survey data. This map of the United States shows rates of hearing difficulty by county. Rates are broken into five categories ranging from 1.03% to 16.64%. Rates of hearing difficulty appear highest (6.33-16.64%) in western New Mexico, western Texas, along Kentucky-West Virginia border, Alaska, Maine, and areas of Oregon and Idaho. Hearing difficulty rates are lower (1.03-6.32%) in southern California, parts of Utah and Colorado, and fairly variable across the rest of America. Map produced July 2016 based on 2010-2014 American Community Survey data.